I have been thinking and planning on building a tiny house on a trailer ever since I saw one of Jay Shafer's homes on wheels. I really don't have any experience in building at all but I am still willing to learn and try. That's the only way I'll ever learn, right? I feel like I am a fast learner, and with today's technology it's pretty easy to find help. Worse comes to worse, I do have some friends that are experienced builders. And if they don't want to help I can hire a local handy man if I need to. Like I said earlier, there are lots of opportunities to learn. The best way to start is with some books. After that you can try to look for seminars, shop classes and maybe you can find someone to help in exchange for learning. I've found that the local hardware stores usually have weekend classes. Your school district might offer adult learning shop classes in the evening. Then there is also technical institutes that you can look into so you can get some woodworking experience. The first is to try to find a spot where somebody will let you do this. Maybe a friend or family member that lives somewhere that this wouldn't cause any problems in. The second option is to rent some space or make a deal with someone who will allow you to do this on their land or their warehouse. 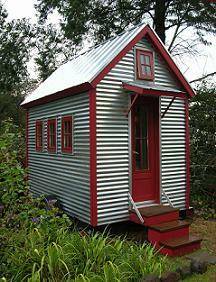 The Small House Book by Jay Shafer also covers the basics with illustrations and instructions. Download your digital copy now or order the print one and either way you'll get a free set of framing plans from Tumbleweed! Next is the building plans. And if you want to build your house on a trailer, then you'll need to know how to put together the floor framing on it. Jay Shafer's book explains this process step by step with pictures. This book is really nice to have if you're thinking about doing this. There's lots of really useful information in it from someone who's really been there and done that. You can purchase his book here. And of course, you won't be able to go far without the building plans. Tumbleweed offers the widest variety of house plans. Most of their plans are $995 and include a consultation with the owner as well as access to one of their seminars. You'll find a few different floor plans and house sizes to choose from. Every plan is thoughtfully designed and perfected with storage space. 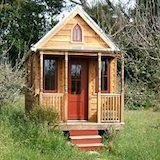 For more information check out my page on tiny house plans. 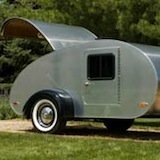 The first step in finding and purchasing the proper trailer is knowing what you're looking for. So once you've picked your house plans you should know. 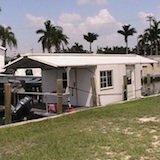 Your trailer is one of the most expensive single items that you will buy for your house. You have to find the correct size. The best places to look are your local area. Lots of people just put these on their front yard with a for sale sign. Keep your eyes open for this. Another good place to look is in your local craigslist. Some more local places to look at Home Depot, Lowes and any other hardware stores in your area. Also do a local search for trailer companies in your town. If you are willing to travel (you might get lucky sometimes) do a search online for the trailer size that you need. You might also want to look on ebay. It's important that you trailer's axle is made to handle the weight you are going to put on it. Your building plans will have more information on this but yes, you'll want a heavy duty axle. Always look through your craigslist for people selling materials you might need like doors, windows, wood and appliances. You might even find some kind of recycled construction store in your town's industrial park area. Ask people who you think might know, you'll be surprised at what's available within a few miles from you. Don't worry if you don't know what to buy right now... 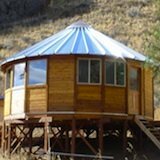 The plans provide you with a list of all the materials you'll need for building a tiny house on a trailer.